Are Your Pets? Will You Know What to Do and What to Bring? If you are forced to evacuate your home because of an emergency, DO NOT LEAVE YOUR PETS BEHIND! Are Your Pets? Will You Know What to Do and What to Bring? If you are forced to evacuate your home because of an emergency, DO NOT LEAVE YOUR PETS BEHIND! On October 6, 2006, legislation made it law, that requires pets to be included in disaster evacuation plans. The law is called Pets Evacuation, Transportation Standards Act (PETS) along with CT Public Act 07-11 which requires all CT municipalities to also plan for pets. Pets cannot survive on their own; so don’t forget to make preparations for your pets. Pets, just like any other member of your family have the their own special needs. • Don’t leave your pet at home! While most evacuations last only a few days, there are times that you may not be able to return quickly. The safest place for your pet is with you. • If you are going to a hotel, call ahead and make sure, in advance that animals are welcome. For on-line information regarding pet friendly hotels please visit the links to the right. • Be sure that your pets are up-to-date on all vaccinations and bring proof of vaccinations with you. It is a good idea to ask your veterinarian now for a copy of your pet’s vaccination record. Keep this with your emergency kit. • IDENTIFICATION OF YOUR PET IS CRUCIAL! The ideal form of identification is a microchip or tatoo. At minimum, your pet should have a tag with his/her name, your name, and your phone number on it. Pictures of your pet that capture identification features are also a good idea. Before a disaster strikes, each household should developed a plan that will include all of their pets. To ensure the plan is functional, it must be practiced before a disaster occurs. 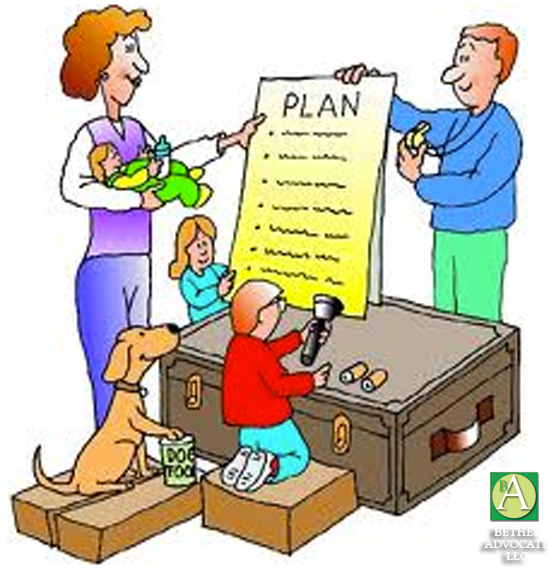 Every 3 months, the plan should be reexamined and updated and changes made known to the entire family. Below are items that should be included in a family and animal evacuation go kit. • Portable, battery-operated ( and extra batteries) or an emergency radio with crank-rechargeable batteries. 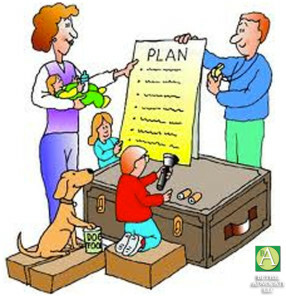 • Include at least one complete change of clothing and footwear for each family member. • Provide a list of animals, how they can be identified (Breed, age, gender, collar, microchip, etc.) AND include a comment regarding the behavioral quirks of each (“easily frightened, ” possible biter,” “likely to hind in the laundry room during a storm,” “afraid of lightening,” etc.). • Feeding instructions for each animal. Include foods to avoid in the event of individual animal allergies. I simply want to say I’m all new to blogging and site-building and honestly savored your web blog. Very likely I’m planning to bookmark your blog . You surely have awesome article content. Thanks a lot for sharing with us your website. I know this web site offers quality based posts and extra information, is there any other site which presents these data in quality? Great amazing things here. I am very glad to peer your article. Thanks so much and i’m having a look ahead to contact you. Will you kindly drop me a mail? hi!,I love your writing so much! proportion we keep in touch extra approximately your post on AOL? I require an expert on this area to resolve my problem. May be that’s you! Looking forward to see you. I do accept as true with all the concepts you have offered for your post. They are very convincing and will certainly work. Nonetheless, the posts are very short for newbies. Could you please prolong them a bit from next time? Thank you for the post. Thank you, I’ve recently been searching for info approximately this topic for a long time and yours is the best I’ve came upon till now. However, what about the conclusion? Are you positive in regards to the supply? Great tremendous things here. I am very satisfied to see your article. Thanks a lot and i am looking forward to touch you. Will you please drop me a mail? lot of it is popping it up all over the internet without my permission. Do you know any solutions to help prevent content from being stolen? I’d genuinely appreciate it. Thank you a lot for sharing this with all folks you actually realize what you are speaking about! Bookmarked. Kindly additionally visit my website =). We may have a hyperlink alternate arrangement between us! I have been browsing on-line greater than three hours today, yet I never found any fascinating article like yours. It is lovely price enough for me. In my view, if all web owners and bloggers made just right content as you probably did, the web might be a lot more useful than ever before. Hiya, I am really glad I’ve found this info. Nowadays bloggers publish only about gossips and net and this is really frustrating. A good site with interesting content, this is what I need. Thank you for keeping this website, I’ll be visiting it. Do you do newsletters? Can’t find it. Whats Going down i’m new to this, I stumbled upon this I’ve discovered It absolutely useful and it has aided me out loads. I’m hoping to contribute & assist other users like its aided me. Good job. A person necessarily lend a hand to make seriously articles I’d state. This is the first time I frequented your web page and thus far? I amazed with the research you made to make this actual submit incredible. Magnificent activity! certainly like your web-site but you need to test the spelling on several of your posts. Many of them are rife with spelling issues and I to find it very bothersome to tell the reality nevertheless I¡¦ll surely come back again. Wow, marvelous blog structure! How long have you been running a blog for? you made running a blog look easy. The overall look of your site is wonderful, as neatly as the content material! Great awesome issues here. I¡¦m very happy to peer your article. Thanks so much and i’m taking a look forward to touch you. Will you please drop me a e-mail? I have been surfing on-line greater than 3 hours lately, yet I by no means discovered any interesting article like yours. It is lovely price enough for me. In my opinion, if all website owners and bloggers made excellent content material as you probably did, the web might be much more helpful than ever before. you’re really a excellent webmaster. The site loading pace is incredible. It seems that you are doing any distinctive trick. Furthermore, The contents are masterpiece. you’ve performed a magnificent job on this topic! I and also my pals were reviewing the good tips and hints from your website while then developed a terrible feeling I had not thanked the blog owner for those tips. All the young boys ended up very interested to learn all of them and already have seriously been using them. Appreciate your actually being simply thoughtful and for deciding upon these kinds of magnificent subject areas millions of individuals are really wanting to know about. My very own honest regret for not expressing gratitude to earlier. certainly like your web-site but you have to test the spelling on quite a few of your posts. Many of them are rife with spelling problems and I in finding it very bothersome to inform the reality nevertheless I will certainly come again again. Hello there, I found your site by means of Google at the same time as searching for a comparable matter, your website came up, it seems great. I’ve bookmarked it in my google bookmarks. Thanks for any other informative site. The place else may I am getting that type of info written in such an ideal means? I’ve a challenge that I am simply now running on, and I have been at the look out for such info. Good day there, just became mindful of your writings through yahoo, and realized that it is truly good. I’ll like should you decide retain this approach. Whats Happening i am new to this, I stumbled upon this I have discovered It absolutely helpful and it has helped me out loads. I am hoping to give a contribution & aid different customers like its helped me. Great job. I am only writing to let you be aware of of the fantastic experience our daughter enjoyed going through your web page. She noticed numerous things, most notably what it is like to have an incredible helping spirit to have other individuals smoothly completely grasp specific specialized topics. You actually exceeded our expected results. Thanks for showing such good, trustworthy, edifying and also easy tips on your topic to Gloria. I together with my pals were checking out the nice guidelines from your web blog and so all of the sudden got a horrible feeling I never expressed respect to the web site owner for those techniques. All the ladies had been for this reason joyful to see all of them and already have in reality been making the most of those things. Thank you for being so thoughtful and also for having varieties of marvelous themes most people are really eager to know about. My personal honest regret for not saying thanks to earlier. Useful info. Lucky me I discovered your website accidentally, and I’m surprised why this coincidence did not came about in advance! I bookmarked it. you’re truly a excellent webmaster. The site loading velocity is amazing. It seems that you’re doing any distinctive trick. Also, The contents are masterpiece. you’ve performed a fantastic process in this topic! What i don’t realize is in reality how you’re not actually much more well-appreciated than you may be now. You’re very intelligent. You know thus considerably in relation to this subject, produced me in my opinion believe it from so many varied angles. Its like women and men are not interested except it¡¦s something to accomplish with Girl gaga! Your own stuffs excellent. At all times handle it up! hi!,I really like your writing so so much! percentage we be in contact extra approximately your post on AOL? I require a specialist on this house to solve my problem. May be that is you! Taking a look forward to look you. later on. I want to encourage you to ultimately continue your great posts, have a nice weekend! I have been surfing online greater than 3 hours lately, yet I never discovered any fascinating article like yours. It is lovely value enough for me. Personally, if all webmasters and bloggers made just right content as you probably did, the net will probably be much more useful than ever before. Useful info. Fortunate me I discovered your website accidentally, and I am shocked why this coincidence did not took place in advance! I bookmarked it. My husband and i felt really fulfilled when Louis managed to do his researching with the ideas he had in your weblog. It’s not at all simplistic to just choose to be offering facts which usually the rest have been selling. Therefore we acknowledge we have the blog owner to give thanks to for this. The explanations you made, the simple website navigation, the friendships you can help to create – it’s all wonderful, and it’s leading our son and the family know that that content is exciting, which is especially essential. Thank you for the whole thing! Generally I do not read article on blogs, however I wish to say that this write-up very pressured me to try and do so! Your writing style has been amazed me. Thanks, very great post. Just wish to say your article is as amazing. The clearness in your post is simply excellent and i could assume you’re an expert on this subject. Fine with your permission let me to grab your RSS feed to keep updated with forthcoming post. Thanks a million and please continue the gratifying work. hi!,I like your writing so a lot! share we communicate more about your article on AOL? I require an expert on this house to resolve my problem. Maybe that’s you! Taking a look forward to peer you. You could definitely see your expertise within the paintings you write. The world hopes for even more passionate writers such as you who are not afraid to say how they believe. At all times go after your heart. I¡¦m now not positive the place you are getting your info, however good topic. I needs to spend a while studying much more or understanding more. Thanks for wonderful information I was searching for this info for my mission. I precisely wished to appreciate you yet again. I do not know the things I would have made to happen in the absence of the type of solutions revealed by you over that industry. It actually was a difficult circumstance in my view, however , witnessing this expert manner you managed that forced me to weep with delight. Now i am happy for the service and in addition hope you comprehend what a powerful job you are doing educating some other people with the aid of a site. I’m certain you haven’t got to know all of us. Its such as you read my thoughts! You seem to grasp a lot about this, like you wrote the ebook in it or something. Hiya, I am really glad I’ve found this information. Nowadays bloggers publish just about gossips and internet and this is actually frustrating. A good website with exciting content, that’s what I need. Thanks for keeping this web site, I will be visiting it. Do you do newsletters? Can not find it. I want to express my appreciation to this writer just for bailing me out of such a issue. As a result of checking throughout the online world and seeing advice that were not productive, I figured my life was well over. Existing without the presence of solutions to the issues you’ve resolved as a result of the review is a critical case, as well as the kind which may have badly damaged my career if I hadn’t noticed your site. Your primary mastery and kindness in controlling all the details was precious. I don’t know what I would have done if I hadn’t come across such a thing like this. I am able to at this point look ahead to my future. Thanks for your time so much for this reliable and effective help. I won’t be reluctant to endorse your web blog to anybody who should receive tips about this subject matter. I will immediately grab your rss feed as I can’t in finding your e-mail subscription link or newsletter service. Do you’ve any? Kindly permit me realize in order that I may subscribe. Thanks. I simply wanted to send a simple remark to appreciate you for those pleasant hints you are posting on this site. My prolonged internet look up has finally been compensated with beneficial ideas to exchange with my close friends. I ‘d declare that many of us website visitors actually are very much lucky to be in a great place with very many marvellous professionals with very helpful advice. I feel quite happy to have encountered your entire web site and look forward to plenty of more brilliant moments reading here. Thank you again for a lot of things.